DHM Series High Pressure Grinding Roll is a newly crushing and grinding equipment with wide adaptability for fine and superfine material process. Working together with the presetting crushing pressure,the two crushing rollers will be pushed in the opposite running directions by using the hydraulic cylinder with accumulator in order to ensure the stability of crushing pressure during the whole processing. Therefore, the high pressure crushing for materials will be achieved between two rollers.The machine can be widely used for many kinds of materials in fine crushing and grinding work to produce fine materials with various specifications such as construction, mining, metallurgy industries.The machine can also be used in fine grinding for metallurgical slags, which simplifies the processing technology and contributes more fine tailing for the following process. 1. 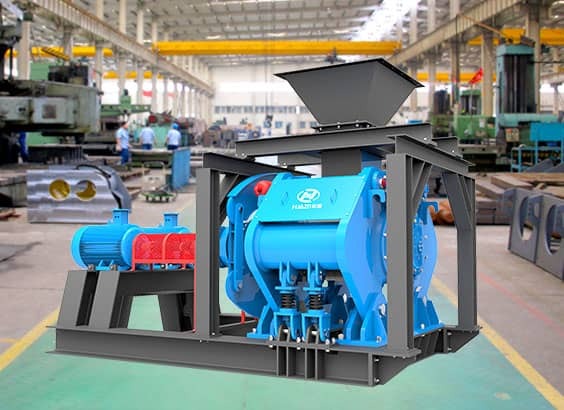 Applied the high pressure crushing mechanism, the machine will have the higher crushing efficiency, lager crushing ratio and wider adaptability. 2. To adjust the clearance of roll surface automatically, so it can keep the crushing force constancy and makes the better grain shape and more fine granularity. 3. The high wear-resistant alloy materials and embedded structure of liners for the roller surface, which extend its service life and make easy replacement without dismantling. 4. Equipped with the hydraulic control system with the reliable performance, which makes the machine protected by the de-ironing and overload functions. 5. The different working pressure should be set according to the different working conditions. 6. The materials will be ground by the constant non-impact crushing pressure from crushing rollers, which makes lower noise with less dust. Remark: The capacity and granularity distribution should be affected by the feed size, hardness of materials, moisture and clay content.